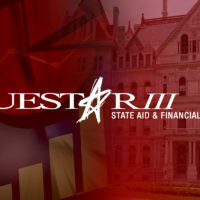 Questar III celebrates its 40th anniversary during the 2017-2018 school year. Since 1977, our organization has grown and evolved to meet the changing needs of our school districts and students. Have a memory to share about the last 40 years of the BOCES? We invite you to celebrate and recognize this milestone by sending any comments or photos to photos@questar.org or tagging @QuestarIII or #QuestarAt40 on social media. You can like us on Facebook and follow us on Twitter, and Instagram. We will share your photos and comments on our social media accounts throughout the year.